Something strange happens upon entering the tiny “town” of Harmony, population 18. First, your cell phone stops working. Then, as if sucked into a Twilight Zone episode, time evaporates. Hours sweep by as you lose yourself in the fiery glow of a glassblower’s handiwork. Yellow finches and hummingbirds flit from branch to branch as you wander the old brick courtyard, awash in golden sunshine and cool, coastal breezes. Cozying up to a pew inside Harmony’s petite chapel or marveling at the miniature post office, it’s easy to imagine what life was like back in 1869, when Harmony’s old creamery first opened its doors. Located off a scrubby coastal route that would one day become Highway 1, the land was once home to dozens of dairy ranches founded by Swiss immigrants. Rivalries between these early settlers eventually led to bloodshed, and in 1907, the ranchers called for a truce, renaming the town in that spirit. DAIRY LIFE: Third-generation dairy farmer and Harmony Valley Creamery owner Alan Vander Horst (left) aims to restore and refresh Harmony’s historic creamery building with a restaurant serving up Swiss-Italian grub and a creamery shop featuring fresh cheese curds, milk, butter, semi-soft cheeses, and ice cream. Project manager Tom Halen (right) provides the hospitality know-how. The Harmony Valley Dairy Co-op, founded in 1901, would continue to operate until 1955, churning out famous Harmony milk, cheese, and butter. Hollywood starlets and even nearby neighbor William Randolph Hearst were known to drop by the town, which once boasted a school, stable, gas station, and blacksmith. Today, relics of the original town remain. Shops selling glass art and pottery stand as tesitments to the village’s 1970s resurgance as a funky artists’ community. The little chapel might be the crown jewel of Harmony (still used for weddings to this day), but if you ask me, the heart of the village lies in the old creamery building. Now, third-generation dairy farmer Alan Vander Horst is intent on breathing new life into the structure’s wooden boards and peeling paint. If the permitting process goes smoothly, the historic site will boast a kitchen, rustic dining room, outdoor patio, and dairy shop specializing in fresh, artisanal cheese curds (yes—dairy cows will dot the hillsides, just like in the old days). “My cows are coming,” Vander Horst said with confidence while showing me around. Standing in the courtyard, I scanned the landscape, trying to step into the dream that inspired Vander Horst to purchase the 2.5-acre unincorporated community last June. The Cal Poly alum knows a thing or two about dairy. His grandparents operated a dairy farm in Southern California during the 1900s. He grew up in a dairy farming family in the San Joaquin Valley. After graduating from Cal Poly, Vander Horst moved to Texas to start his own dairy operation. Now, he and his wife and kids are back in SLO, invigorated by plans to reignite the coastal village. One of the first things I noticed? The bricks! They weren’t disheveled and uneven anymore, snagging on the sole of your shoe. But they weren’t new, either. As it turns out, Vander Horst’s team removed each old brick, then lovingly re-installed them flat. Vander Horst isn’t just about restoring the town—he wants to celebrate its connection to the greater Central Coast region. Flecks of abalone shell glisten from the refurbished pathway—an homage Harmony’s unique location between Cayucos and San Simeon. The post office, closed in 2011, will be retrofitted and reopened for the residents’ use. 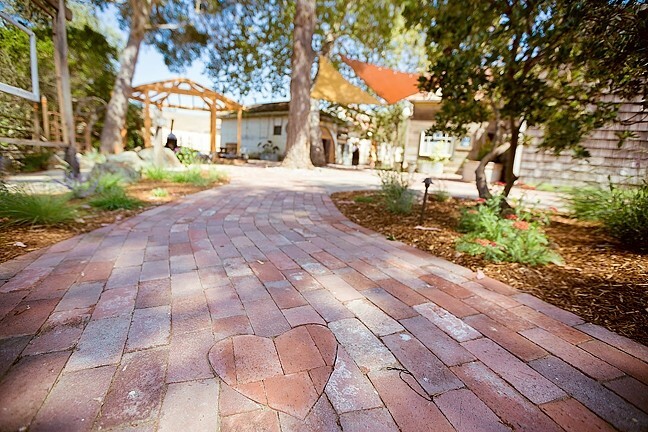 HARMONY, REFRESHED: Old bricks that once caused visitors to stumble have been removed and replaced flat in the historic town of Harmony. One way: Bring more people into the lore. Surrounded by newly placed bricks and tumbled glass from the onsite Glassworks studio, the courtyard pathway showcases a new plaque for an old song. The monument (inspired by a record-shaped mount that once hung on the side of the Harmony chapel) honors Jehry Miller’s 1979 Zephyr Records release, “Harmonizing in Harmony Population 18.” I listened to the song on YouTube, and it’s a dreamy take on driving up Highway 1 and finding peace of mind in the little town, long celebrated for its artistic allure. Although Vander Horst admits he is new to the hospitality and tourism industry, he knows how to get on the public’s sweet side. Maybe you caught a glimpse of the Harmony Valley Creamery food truck at the Mid-State Fair? The refurbished vintage milk truck supplied samples of Vander Horst’s locally made ice cream sourced from Cal Poly dairy and imbued with fresh, seasonal ingredients. One day, Vander Horst hopes to use his own happy Harmony cows to create the rich treats. Project Manager and right-hand man Tom Halen is helping out on that front. With a hospitably degree from Cal Poly Pomona, training from the California Culinary Academy, and 15 years in both financial services and the food industry, he’s a good man to have around. According to Halen, the eatery will feature about 70 seats with an indoor-outdoor vibe, wine room, patio with fireplace, and lounge. The restaurant is slated for completiton next spring. HARMONY DINING : A new restaurant featuring Italian-Swiss eats is slated to open next spring in the old dairy community of Harmony. 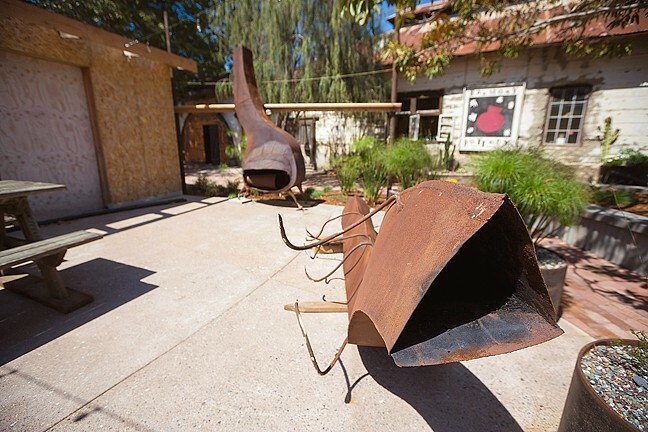 Pictured, repurposed metal will be used to create interesting and inviting fireplaces for a rustic outdoor patio. This casual mix of farm-fresh flavor and eco-friendly ethos seems to jive with the area’s progressive roots. In the past, locals supported and frequented the town’s now defunct Harmony Pasta Factory. When I toured the creamery building, there was still quite a lot of work to be done. It’s not unlike the Winchester Mystery House: Hidden rooms are everywhere. I ran my hands over the dusty concrete walls used to keep buckets of milk cool for so many decades. An ancient, rusty scale stood in the corner, a testament to the ranchers who shed their blood, sweat, and tears to develop the land into a renowned dairy destination. Vander Horst showed me the loading dock, where so much frothy white goodness was lugged—and later skimmed, churned, bottled, and sold. 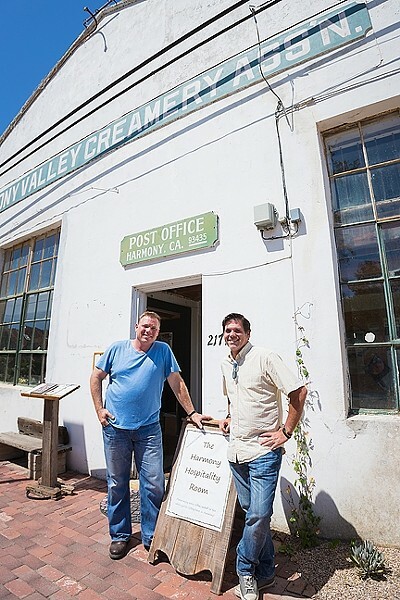 Part of the creamery will be reserved for a museum showcasing artifacts from Harmony as well as relics from SLO’s Octagon Barn dairy operation and Spooner’s Ranch, which ran cattle, hogs, dairy cows, and housed its own seaside creamery. Farm equipment and black-and-white photos will soon grace the walls. LIVING IN PERFECT HARMONY: For information on renting out Harmony for weddings or other events or to learn more about Harmony Valley Creamery, contact info@harmony.town or call 543-2288. Mark my words: Milk will flow. Hayley Thomas is more than ready for some fresh cheese curds at hthomas@newtimesslo.com.